When running a spread offense that utilizes a power run game, the H-Back position is key. The position opens up a variety of possibilities in the run game that are not usually afforded the offense with an in-line tight end. The position was used some during the Chip Kelly/Mark Helfrich era, but was a staple of the offense that Willie Taggart brought to Eugene in 2017. It will be a component that definitely sticks around going forward. The H-Back position is a mixture between the tight end and fullback positions (yellow circle above). Whereas the typical alignment for an in-line tight end is directly along the offensive line, an H-Back can line up anywhere from a wingback position off the OT’s hip, directly behind the OT, behind any of the interior gaps, or directly beside the quarterback in shotgun/pistol. Lining up the H-Back directly beside the quarterback is yet another tactic Coach Marcus Arroyo has first-hand experience with while working at Oklahoma State. Above, you can see how the H-Back is used as a lead blocker. Extra pressure comes off of the edge and he picks it up. He doesn’t make a very good block, but the point remains the same. Chris Ault, the innovator of the Pistol formation, has said that his tight ends were always in wing. This afforded him the ability to utilize one of his favorite inside zone concepts, the slice action. The slice calls for the H-Back to cut across the formation, blocking the backside defender (see above). This action frees up the OT, who can now aid in double teams and getting to second-level defenders. The slice is pretty common in football today, but with the emphasis that Ault placed on it, surely Coach Jim Mastro has carried it with him to Oregon. One of my favorite things the H-Back gives to a spread offenses is the ability to run Iso. This simply means that the offense is isolating a second-level defender on a second-level offensive player, usually a fullback. In the video above, the Penn State Nittany Lions run Iso from the shotgun. The H-Back here gets just enough of the isolated LB to help spring the RB for a big gain. Besides opening up the run game, the alignment of the H-Back can better assist in pass protection at different points of attack when called upon. On top of watching for the variety of ways the Ducks use the H-Back position this fall, I’ll be curious to see how the University of Washington does against the Auburn Tigers. Gus Malzahn heavily deploys the H-Back in his offense, and it could really open our eyes to some of the weaknesses of the Husky defense. 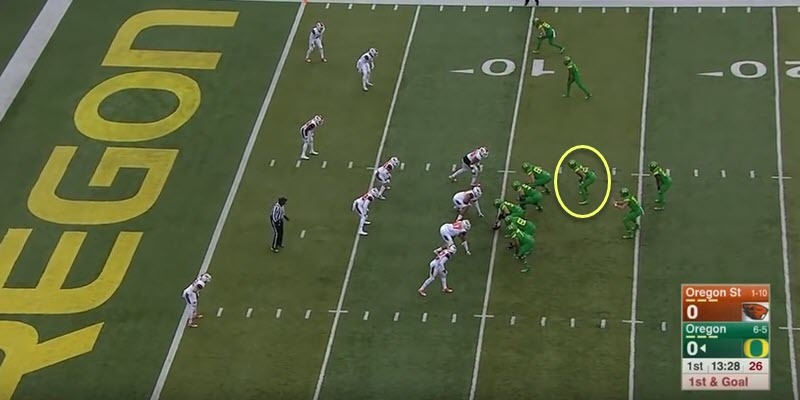 On top of what I’ve shared above, the H-Back position opens the door for power, counter plays and a host of other run game schemes Oregon fans enjoyed last season. Of course, the Ducks will still use in-line tight end alignments, but I predict the offense will use far more H-Back alignments under Cristobal and Arroyo than what we’ve seen in years past.